Barton Cross, near Preston, Lancashire. North-side. OS Grid Reference: SD 53500 37332. 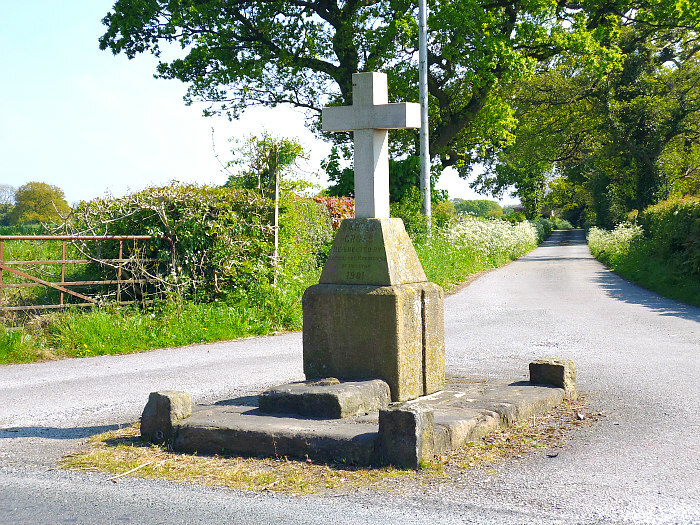 About 1 mile to the east of Barton village on Barton Lane, near Preston, Lancashire, and at the north-side of a country lane or track running up from Barton House, is the ‘Barton Cross’, which is, sadly, an early 20th century cross that now sits in the middle of some very old stone pavings. One of these flat paving stones has prehistoric cup-marks! There are some strange lumps of stone at the side of, and also at the edges of, the surrounding base stones – which are probably from an older cross that had stood on this site in the 19th century – and which may have been of a Late Medieval date? We must though ask where did the cup-marked stone come from? Did it originate on the moors to the north, or did it come from somewhere else? You can reach the cross from Barton Village, a few miles to the north of Preston. Head east onto Barton Lane, going under the M6 Motorway, in the direction of Little Westfield and Goosenagh; the cross can’t be missed as its at the cross-roads, where the lane from Barton House emerges. The south-side of the cross. 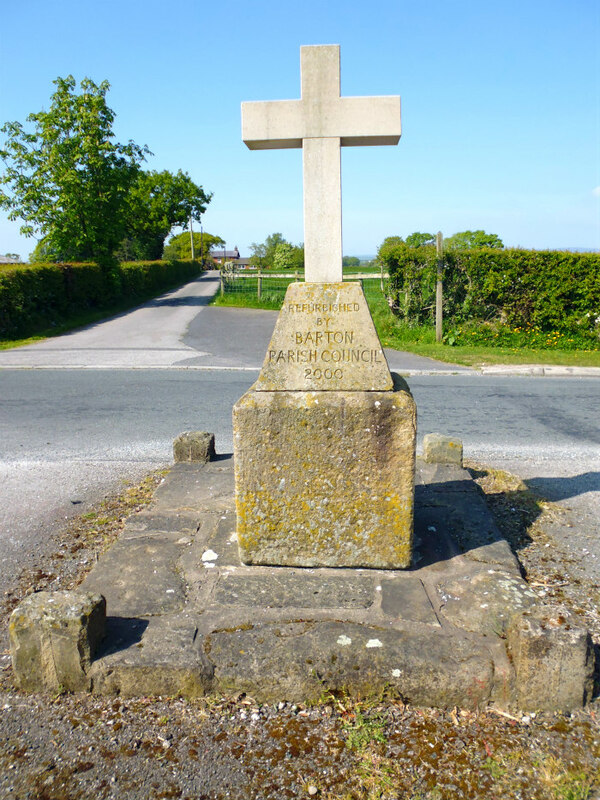 The present-day ‘Barton Cross’ dates from 1901 and is a pyramidal-shaped stone on a square stone block – with a plain, chunky stone cross on top, which looks to be more recent probably in 2000. But there was at least one older cross on the site prior to this one, which might have been a late Medieval cross? We can see the original socket hole, a strange and curious lump of stone at one side, and four square stones at the edges of the flat stone-paved surround. Were these four stones, at some point in the past, supports or footings for stone posts which would have had iron chains attached to them – thus acting perhaps as a protective surround for the cross? The north-side of the monument has an inscription recording its erection in 1901 by a Preston councilor, whereas the inscription on the south-side records its refurbishment by Barton Parish Council in 2000. I understand that the large lump of stone at the side of the monument could have been an old cheese press, according to the Historic England website. The Historic England list entry number is: 1073555. Cup-marks on one of the paving stones. 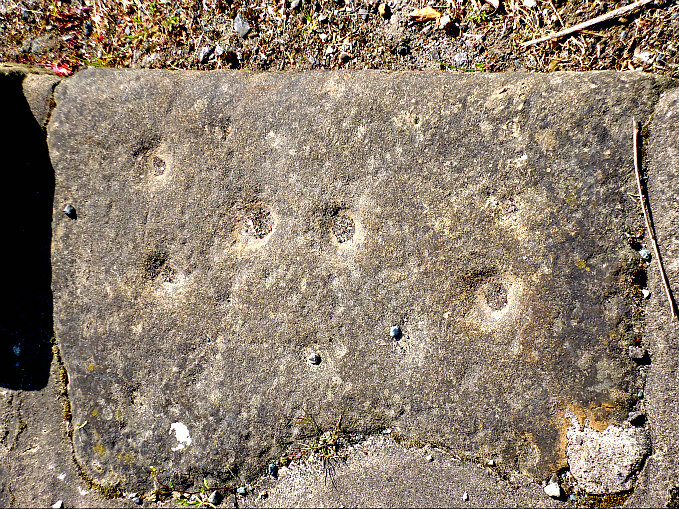 B/w photo of cup-marks on one of the paving stones. Of much more interest, though, are the ancient cup-markings on one of the flat paved stones around the base of the Barton Cross. This has obviously been fashioned to fit into this position. There are at least 5 small but well-defined cups-marks and maybe 4 or 5 now quite faint ones. But where did this cup-marked stone originate? Did it come from the moors to the north or northeast, or did it perhaps come from nearer to home? That we will probably never know unless someone living round here can answer that question. 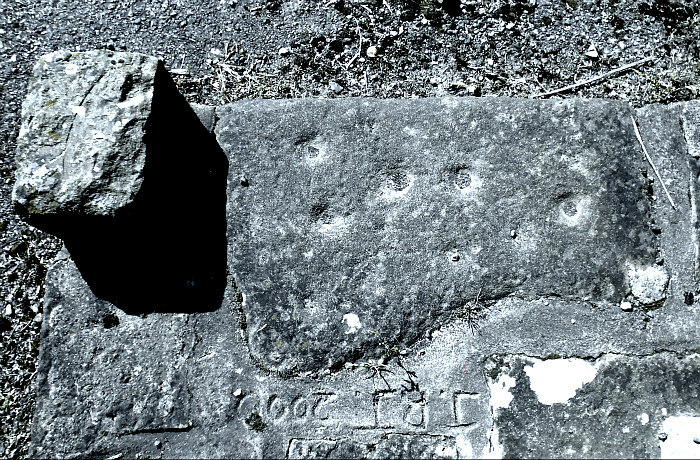 It is with thanks to Paul T. Hornby & TNA (The Northern Antiquarian) for discovering this ancient stone with its carvings in 2017. See TNA websites (below) for their site pages. © Copyright, The Journal of Antiquities, 2019. Categories: Cup-Marked Rocks | Tags: Barton Cross Cup-Marked Stone near Preston in Lancashire | Permalink.